Joni Marsch feels most alive when she is creating something out of nothing. She cuts through clutter, crystallizing the complex, to bring new opportunities to life. Gregarious and gritty, Joni sees business challenges as an adventure and inspires her team to come along for the ride. Joni’s entrepreneurial spirit has enabled her to turn strategy into action throughout her 16-year career in global marketing, corporate strategy, and finance. Her previous experience includes owning her own business and roles at Northrop Grumman and Baxter International Inc., where she managed a $140 million vascular access business and launched a medical device with over $75 million in sales. 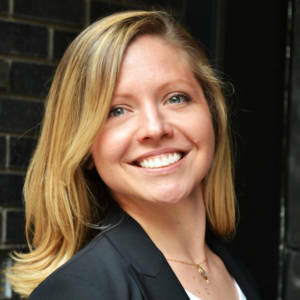 Joni has an MBA in marketing and entrepreneurship from Northwestern University and a bachelor’s degree in international studies, business, and politics from the University of Illinois at Urbana-Champaign. Quote to live by: “The secret of success is to do the common thing uncommonly well.” — John D. Rockefeller Jr.